Take the pain out of cleaning atriums and other hard to reach windows. 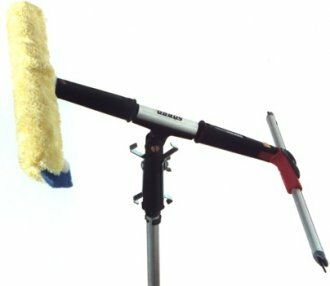 Twin Angle is a scrubber and a squeegee on one handle, eliminating the time consuming procedure of changing tools. Simply scrub, turn over, and squeegee off, easy as 1-2-3. When used with the Sörbo Monster Pole it's possible to clean hard to reach windows on the fourth floor. Its unique design makes it possible to clean the entire length of those windows. Even deep frame commercial windows are a breeze.